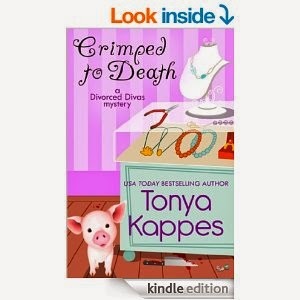 Today's review is for: "Crimped to Death" A Divorced Diva Mystery Written by Tonya Kappes. First I am friends with Tonya on Facebook and a member of her Street Team. If you would like to know more about Street Teams just ask. The review I am posting is my honest opinion of the book and in no way influenced by my friendship with Tonya. Now onto the review. This is a delightful mystery that will have you laughing and guessing throughout the entire book. The characters are fun, down to earth, varied and have just enough contrast and conflict to make them believable. Set in a small town of Swanee, Kentucky. First you might want to know who the Divorced Divas are, they are a group of women who got together to bash, trash their ex-husbands while cheering each other up and supporting each other through all kind of troubles. After one of the Diva's decided to take the bashing and suggested revenge plots literally instead of figuratively the Divas were paid a visit by local law enforcement who urged them to bash their ex-husbands only figuratively from then on. The Divas are en eclectic blend of women from all walks of life. They even bicker with one another the way true friends will, but they always have each others back. Holly who runs the local beading shop and is dating Donovan the local self defense instructor/ college professor is one of the Divas. Holly's ex Sean does not seem to like the fact that he has been replaced and likes to cause conflict for Holly whenever possible. Trust me when I say you will want to slap Sean.